Timber industry and design professionals were honoured for their creativity and ingenuity at a gala event that ran in Auckland last night. Entries in the 2018 NZ Wood-Resene Timber Design Awards demonstrated new and different ways to use timber that nevertheless meet all building codes and criteria as well as being beautiful. Entrants competed within ten categories covering everything from residential and commercial architectural excellence to engineering innovation, multi-storey construction and student innovation. Structural performance and aesthetic excellence were highlighted across all categories. The Resene Supreme Award went to the iconic He Tohu Document Centre within the National Library, inspired by the form and function of a waka huia (treasure container). “This is the perfect vessel to display the founding documents of Aotearoa,” said the judges. “Highly developed manufacturing technologies are woven together with traditional timber materials, showcasing how timber can deliver technological, social and cultural value in a beautiful way.” This entry also won the Niagara Timber Products’ Interior Innovation category. Runner up was Cymon Allfrey’s Family Bach in Hanmer Springs (photo). “An interesting redefining of the family bach as a series of separate yet interrelated buildings with shared common spaces,” commented judges. “A building where architecture hero’s wood, and wood has hero’d architecture.” This entry also won the CHH Woodproducts Futurebuild Residential Architectural Excellence Award. The South Island again garnered the bulk of winning entries. Five winners or highly commended entries featured Canterbury builds, and Kaikoura, Nelson and Otago projects also won awards. Plant and Food Research’s Seafood Research Centre won Nelson Pine Industries’ Excellence in Engineered Wood Products category. Judges commented on the entire structure being prefabricated timber featuring highly refined joint detailing. “This shows how versatile timber can be for both structural and non-structural applications,” they said. 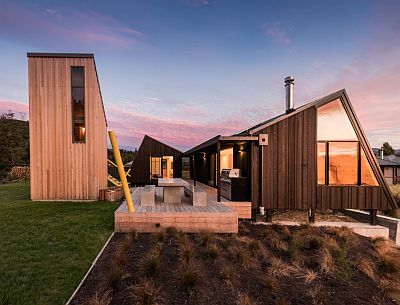 NZ Farm Forestry –sponsored winner for the NZ Specialty Timber category was the Pukapuka Road house in Rodney. Judges were impressed that 'pickled' timbers were sourced from Northland rivers, and as a result have purple, green and blue hues along with the traditional browns. “The skilful combination of these unique materials produces interior spaces of remarkable mood and atmosphere,” they said. Further details and images can be seen here.